On a recent vacation trip, Carl and I visited the location in Dallas, Texas, where President John F. Kennedy was assassinated in 1963. Everyone who was old enough that day remembers it well as I do. I was 13, in the ninth grade. All the television coverage, adult reactions, the Warren Commission and Oswald murder are etched vividly in my mind. Carl was only seven at the time, too young to be aware of the significance of the event, and with no closed captioning on TV, he hardly remembers it. It was visceral for me seeing the plaza looking exactly the same as it did in all the photos and videos over a half-century earlier. I had a deja vu sensation, like the past and present fusing somehow as I stood there. Probably the most startling thing for me was that cars drive on that road to this day right over the painted X that marks the place where the shot hit JFK. And bringing it all together was the “Sixth Floor Museum at Dealey Plaza” where the whole story is laid out before visitors in photos and videos and displays and artifacts until you finally reach the actual corner window on the sixth floor where Lee Harvey Oswald laid in wait and you can look down on the X on the road from his point-of-view. It gave me chills. Being there was a memorable experience for me personally, but there was another way in which this experience was memorable for both Carl and me. We have been to many venues where they have an audio tour device of some kind which of course does Carl no good. Museums and other historic venues often will offer him a “script” of the tour which is just too much reading. It’s awkward to walk along, holding and reading a “script” while trying to see things and of course, he wants to take pictures, so he usually declines. I always try to sign anything that seems essential for him to know, but otherwise, he just misses out on so much. 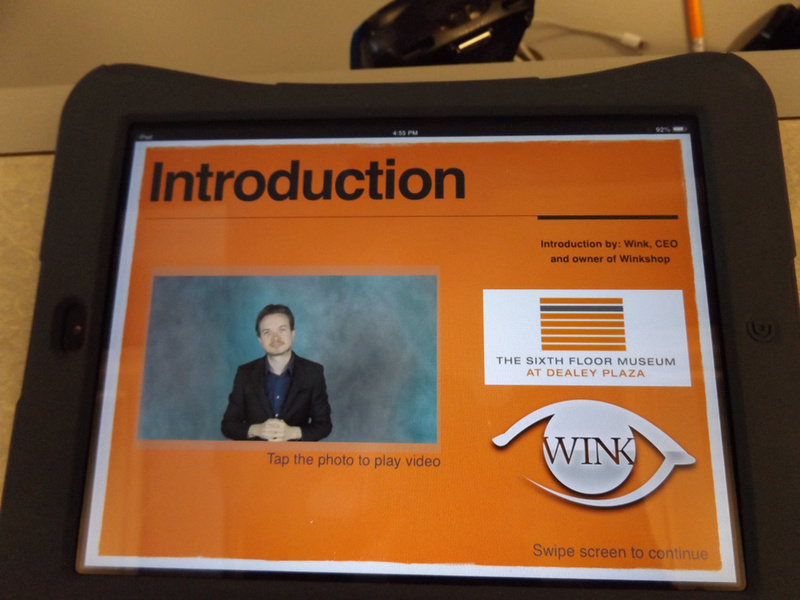 This is our usual experience, so we were pleasantly surprised to find that this museum provides people who ask for it with an iPad that has the tour information produced on it in videos by “Wink” (winkasl.com) in American Sign Language (ASL). Carl didn’t watch all the videos and I didn’t listen to all the audio. The museum was intense and the tour extremely detailed, but for once, he had the advantage of an ASL version like we hadn’t seen before. It was awesome! Very professional thanks to “Wink”. We felt supported and included and are grateful for this very excellent support for people whose primary language is ASL. 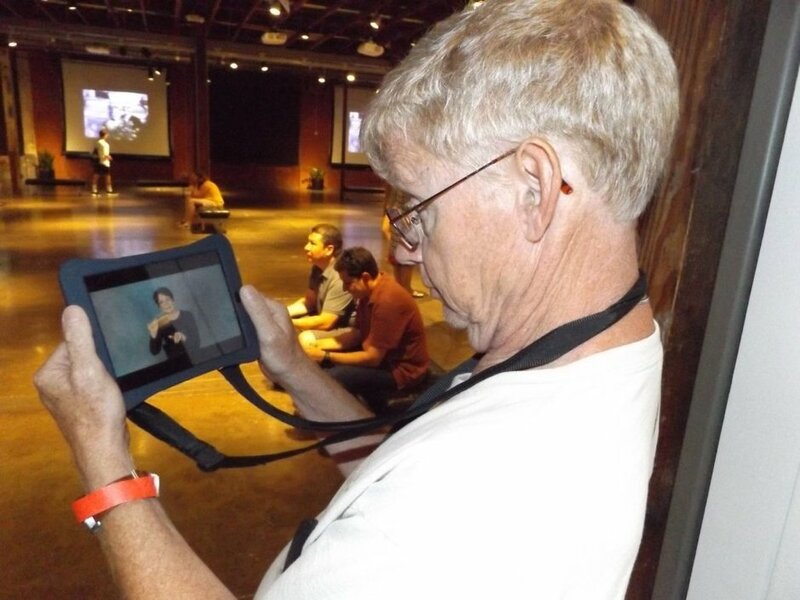 Kudos to the “Sixth Floor Museum at Dealey Plaza” in Dallas! I hope other venues will do the same.